We are not ok with this. I've written before about Cambodia (here, here, here, here, here and here) and what is going on there as well as what God is doing there. Well, recently I came across another incredible ministry working there. Praise God! Asian Hope believes that education is the best means of helping the people of Cambodia. We exist to protect, educate, and empower because we want to see a Cambodia free of societal and generational poverty. Asian Hope's mission is to protect, educate, and empower children and families in Cambodia through Christian education and community development. You can be a part of their work by purchasing and wearing bracelets and necklaces from the Coin Charms for Kids Collection where each charm helps meet a specific need. How fun is that! Fashion with purpose. Every Coin Charm serves as a reminder of a child blessed and provides an opportunity to pray for that child and their family, and to share the needs of Cambodian children with others. Coin Charms for Kids come in a drawstring pouch with an enclosure card indicating how the proceeds from each charm bless a child in Cambodia. These coins are actual Cambodian Riel coins that are no longer in circulation in Cambodia. They are generously offering the bracelet below worth $86 and includes the stainless steel bangle, the Education Charm, Clean Water Charm, Good News Charm and School Supplies Charm. They are also including a copy of "My Dad The Tuk Tuk Driver" book, a children's book that tells the story of one little boy's daily life in Cambodia- the perfect read for any age child. All you have to do is enter by doing any or all of the options below. 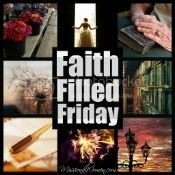 Next Faith Filled Friday I will let you know who the winner is. And, once again I am having to take a bi on Featured Posts. The Missional Women Conference starts tomorrow (you can still sign up for the FREE webcasthere) and I have been up to my ears in details. Thanks for your grace friends. Thanks for sharing this very important message. I knew about the problem, but I will pray with my husband especially for the impact of this post and the work being done there. My weekend blog hop on Amanda's Books and More has a nice photo with Bible verses (Rom. 5:3-5) that you are welcome to pin and my "Pin it" button is in my side-bar to assist with that. God bless and have a wonderful weekend! I am not o.k. with it either, and am thankful for people like you and others who will seek to educate and research and get the word out! Thanks for hosting today and I know that the conference will be awesome! We are not ok with this. I love your firm words. Learning what to do about this issue from the middle of my happy place in the middle of the country is a challenge. Thanks for prompting me to think. Visiting from #Imperfectprose. Thankful I did.